Many people take vitamins and nutrients to support their health, but are you taking the rights ones to specifically target your health needs? 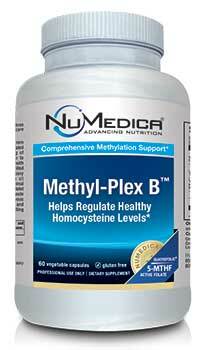 NuMedica Methyl-Plex B provides support for the cardiovascular system as well as other systems throughout your body. With its ability to enhance methylation, an essential metabolic process that occurs in all of our cells, this nutritional supplement with its B vitamins may help you ward off conditions like stroke, diabetes, osteoporosis, some cancers, dementia, and even mood disorders. Because NuMedica is a pioneering leader of the natural and nutritional supplement industry, you can rely on their products, which are known for safety and effectiveness. NuMedica Methyl-Plex B contains therapeutic levels of ingredients that are known to support cardiovascular health. Folate, for example, is a water-soluble B vitamin that may reduce the risk, according to medical research, of stroke and heart disease by 20%. With its ability to lower homocysteine in the blood, folate helps to reduce hardening of the arteries and blood clots. Folate, of course, can also help ward off birth defects like spina bifida. NuMedica Methyl-Plex B also contains Trimethylglycine (TMG), which can also help lower homocysteine levels in the blood to prevent hardening arteries and blood clots. High homocysteine levels are associated with depression and other mood disorders as well, so TMG and B vitamins are essential for keeping these homocysteine levels low and under control. With its other B vitamins, NuMedica Methyl-Plex B can help supports the optimum health of the nervous system, digestive system, and immune system. By supporting methylation, the ingredients in this supplement provide support for the cells of multi-type systems throughout your body.